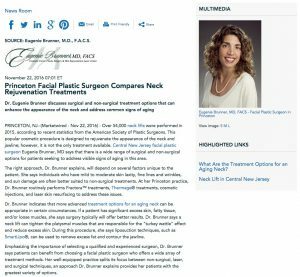 Dr. Eugenie Brunner discusses surgical and non-surgical treatment options that can enhance the appearance of the neck and address common signs of aging. Princeton, NJ — Over 54,000 neck lifts were performed in 2015, according to recent statistics from the American Society of Plastic Surgeons. This popular cosmetic procedure is designed to rejuvenate the appearance of the neck and jawline; however, it is not the only treatment available. Central New Jersey facial plastic surgeon Eugenie Brunner, MD says that there is a wide range of surgical and non-surgical options for patients seeking to address visible signs of aging in this area. The right approach, Dr. Brunner explains, will depend on several factors unique to the patient. She says individuals who have mild to moderate skin laxity, fine lines and wrinkles, and sun damage are often better suited to non-surgical treatments. At her Princeton practice, Dr. Brunner routinely performs Fractora™ treatments, Thermage® treatments, cosmetic injections, and laser skin resurfacing to address these issues. Dr. Brunner indicates that more advanced treatment options for an aging neck can be appropriate in certain circumstances. If a patient has significant excess skin, fatty tissue, and/or loose muscles, she says surgery typically will offer better results. Dr. Brunner says a neck lift can tighten the platysmal muscles that are responsible for the “turkey wattle” effect and reduce excess skin. During this procedure, she says liposuction techniques, such as SmartLipo®, can be used to remove excess fat and contour the jawline. Emphasizing the importance of selecting a qualified and experienced surgeon, Dr. Brunner says patients can benefit from choosing a facial plastic surgeon who offers a wide array of treatment methods. Her well-equipped practice splits its focus between non-surgical, laser, and surgical techniques, an approach Dr. Brunner explains provides her patients with the greatest variety of options. Dr. Eugenie Brunner is a fellowship-trained facial plastic surgeon who is double-board certified by the American Board of Facial Plastic and Reconstructive Surgery and the American Board of Otolaryngology. A graduate of the Robert Wood Johnson Medical School, Dr. Brunner is also a seven-time recipient of the Castle Connolly Top Doctor Award and an active member of the American Society for Laser Medicine & Surgery. She is available for interview upon request.